Cattle prices remained a firm trade with a large entry of stock. Bullocks sold to £1,415 for 570kg, heifers sold to £1,185 for 560kg, weanlings sold to up to £960, suckler cows sold to £1,760 and fat cows sold to £1,571.40 for 810kg. Eoin Loughran £1,415/570kg, Robert Crossett £1,385/680kg, £1,370/700kg, Robert Sands £1,180/570kg, £1,050/580kg, Henry McBride £990/420kg, Seamus McAtamney £980/510kg, £930/490kg, Mark Cowan £860/470kg, Robert Donaghy £85/410kg, £795/430kg, David Nesbitt £755/420kg, £745/380kg, £720/400kg, £700/420kg and Robert Donaghy £740/380kg, £725/380kg, £695/390kg. John Lyle £1,185/560kg, Kevin McHugh £1105/560kg, Dermot Nugent £1,055/520kg, £1,000/440kg, £980/490kg, £970/480kg, £925/490kg, Kevin McHugh £995/540kg, Christopher O’Hagan £990/480kg, £950/480kg, Henry McBride £950/490kg, Dermot Nugent £925/440kg, Conor McWilliams £905/430kg, Kevin McHugh £900/520kg, £900/470kg, £86/480kg, John Lyle £900/400kg, £795/420kg, £825/420kg, Christopher O’Hagan £880/460kg, £855/440kg, Dermot Nugent £850/460kg, £845/490kg and Kevin McHugh £770/470kg, £755/440kg, £750/460kg. James McLaughlin £960/430kg, £860/370kg, Neil Hutchinson £950/370kg, Hugh Savage £890/400kg, Robert Hessin £775/420kg, £775/420kg, £715/380kg, Scott McNeill £765/330kg, Hugh Savage £700/340kg, £680/340kg, Patrick Ferguson £690/310kg, £610/330kg, Scott McNeill £670/350kg, Henry McErlean £645/280kg, Robert Hessin £600/300kg and Henry McErlean £525/220kg. R J and S R Mawhinney £810/420kg, £805/350kg, £775/390kg, £755/380kg, £755/410kg, £730/350kg, £705/340kg, £700/350kg, £700/330kg, £700/380kg, £700/360kg and Ralph Pickering £735/370kg, £735/400kg, £710/370kg. M Mullan £1,760, £1,650, £1,600, £1,570, £1,510, £1,490, £1,480, £1,450, £1,400, £1,380, £1,300, £1,280, £1,250, Neil Hutchinson £1,620, Michael McGlade £1,440, Andrew Millar £1,350, Dermot Nugent £1,350, Ralph Pickering £1,260, Joseph Dickson £1,250, £1,230 and Bracken Hill Farms £1,200. M Johnston £1,571.40/810kg, £1,497.30/690kg, £1,354.20/740kg, £1,159.10/670kg, P Stewart £1,541.60/820kg, Charles McNabb £1,276.50/690kg, I Millar £1,164/600kg, J McCloskey £1,116.90/730kg, Jude Martin £1,056/660kg, £1,006.40/680kg, £1,005/670kg, J McCloskey £991.20/590kg, £897/650kg, Ronan Ward £951.30/630kg, Colin Gibson £884.40/670kg and Charles McNabb £88040/620kg, £880.40/620kg, £879.10/590kg. 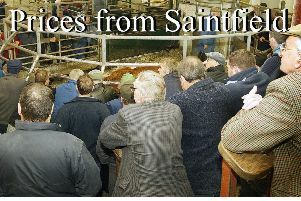 Sean and Dermot McReynolds £1,689.20/1030kg, Eric Connor £1,470/650kg, Wilbert McLenaghan £1,395.90/990kg, Joseph McKenna £1,353/660kg, Alan McMurray £1,246.20/670kg, £1,224/680kg, £1,122.20/620kg, £1,077.30/630kg, Joseph McKenna £1,216/640kg, Robert Dundee £1,110/600kg, Terry Eastwood £1,036/560kg, Thomas Nelson £1,033.50/530kg and Samuel Jackson £1,014.60/570kg.